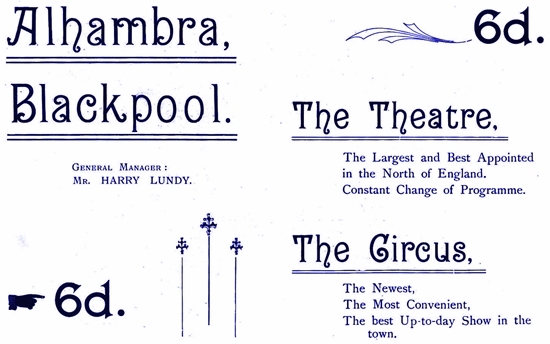 A Guide to 'The Alhambra' Blackpool 1899. 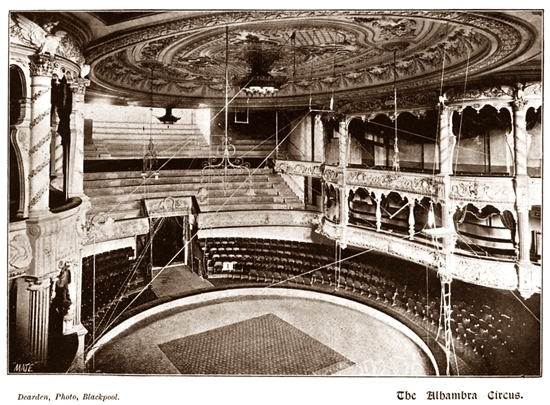 The Alhambra - situated on Central Promenade - was formally opened so recently as July, 1899, and its thoroughly just claim to rank among the first places of entertainment in Blackpool stands as a proof of the continuance of that enterprise for which the town is so far-famed. 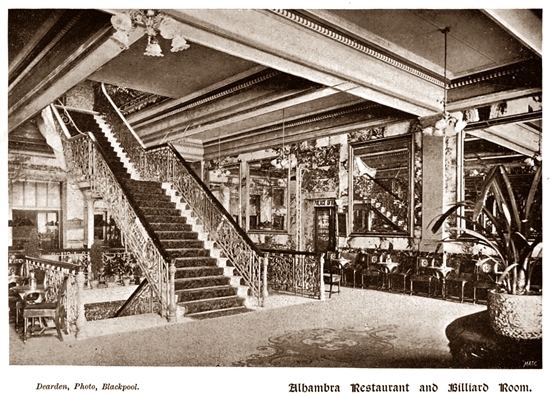 The Alhambra stands on the site of two former entertainment buildings—one of which was the Prince of Wales Theatre and the other the Prince of Wales Baths, or Hall of Aquatic and Variety Entertainment. It was latterly felt that these buildings were not sufficiently up-to-date, and on a company being formed to acquire the site, Messrs. Wylson & Long, Architects, of London, were commissioned to prepare a scheme for erecting in their stead an entertainment building which would use the ground. to greater advantage. The demolition of the old block was rapidly carried out, and on December 4th, 1897, the foundation stone of the present Alhambra was laid by Mr. George R. Sims, the Dramatist, etc. 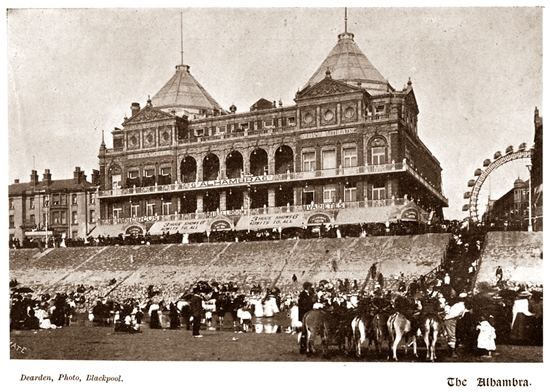 The new building comprises a Circus, Theatre, Ball Room, Restaurant, Lounges, and Roof Promenades. In its interior the Alhambra is designed throughout in a free treatment of Italian Renaissance architecture, and its magnificent front elevation, executed in red brick and buff terra-cotta and surrounded by balconies, forms one of the most imposing objects on the Promenade. The building gives comfortable accommodation for over 12,000 persons, distributed as follows :—Theatre, 3,000 ; Ball Room, 3,000 ; Circus, 2,000 ; Restaurant, Lounges, etc., 4,000. Entering by the centre doorway on the Promenade, access is at once gained to the " Marble Halls." The floor is laid with Italian marble and Venetian mosaic, and the walls are lined with marbles from Italy and Belgium. Two massive flights of solid Carrara marble steps, covered with velvet pile carpets, and flanked with white marble balustrades lead to the upper floors. On the first floor is the Restaurant, which is paved with marble mosaic, and has marble walls, relieved with fine mirrors and other adornments. Further up the Café is reached, and above that the Lounges adjoining the dancing floor and the gallery of the Ball Room. From all these floors direct communication is obtained with the balconies overlooking the sea, and also the Circus and Theatre. On the left hand side of the Promenade front entrance access is obtained to the Variety Circus. This is fitted with a circus ring—removable at pleasure—within an elliptical arena, giving additional floor space whenever such may be necessary for any special form of entertainment. The Circus is lavishly enriched with plastic work, decorated in light tints richly relieved with gold, and upholstered and draped with scarlet velvet. The floor is covered with thick pile carpet in two crimson shades, and the seats are covered with bright crimson Utrecht velvet. The building is lighted with sun burners, electric arc lamps, and innumerable electric incandescent lamps. The accompanying stables consist of sixteen stalls and loose box. The performances during the season include expositions of animal training, horsemanship, and the finest variety turns of the period. On the right hand side of the Promenade front the vestibule to the Theatre is gained, and from this point all parts of the house can be entered with the exception of the pit and gallery—the entrances to which are in Victoria Street, and on the upper floors. The Theatre is arranged in three tiers from the ground floor, each tier having its own foyer and other conveniences. The combination of the colour scheme—terra cotta, green, and gold—is dainty and pleasing. The stage can be entirely shut off from the rest of the building by means of a specially constructed fireproof curtain, and is amply equipped with both electric light and gas. Gracefully designed silk scrolls and gold embroideries lend splendour to the drapings of the proscenium and boxes, and the soft carpeting and luxurious seats afford a wealth of comfort seldom found in such a Theatre. The stage-lighting apparatus is of the most improved type, the arrangement of various coloured lamps with a regulating apparatus enabling the most beautiful effects to be produced. The exits, which are very numerous, are all fitted with patent panic bolts, which release the door on pressure from within ; and plentiful hydrants give further security in case of alarm. Decorated, upholstered, seated, and draped throughout in a most lavish manner, the Theatre is replete with everything calculated to ensure the comfort and the appreciation of patrons. The season entertainments are of an unusually high-class character, the performers being selected from the heads of the multifarious branches of the English and Continental variety profession. 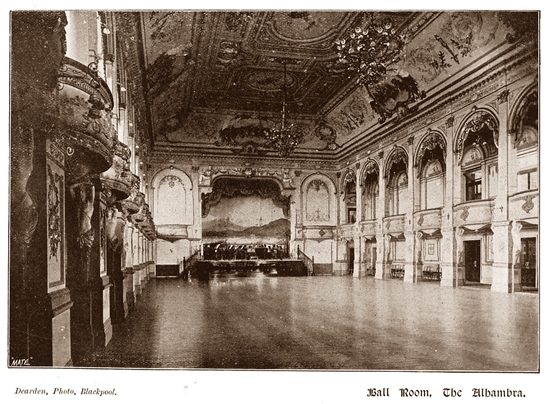 Situated above the Circus, and reached from the central block, either by the marble staircase running through each floor, by the staircase on the east side, or by the passenger lift in the centre hall, is the Alhambra Ballroom— one of the most elegant and luxurious dancing rooms in existence. Its admirable proportions, graceful architecture, chaste decorations, lovely pictures, and delicate drapery in heliotrope and gold, all combine towards an appearance calling forth the sincere admiration of every beholder. The fine parquet floor—supported by innumerable springs—is just of that yielding elasticity dear to the heart of the true dancer. 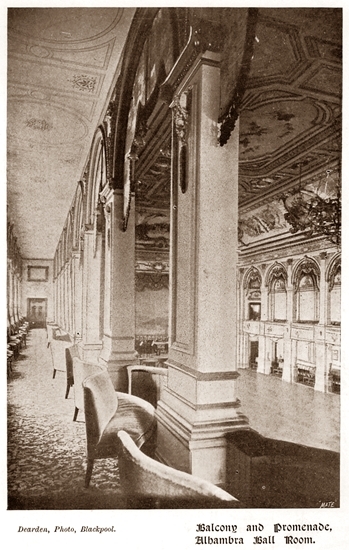 Around the Ballroom is a spacious balcony, from which a full view of the animated dancing assembly is obtained. The floors of the promenade and balconies are covered with a delightfully soft carpet in artistic tones of terra-cotta. On these floors are placed sumptuously upholstered lounges, and cosy angle settees, covered with an exquisite shade of heliotrope Utrecht velvet. Resting on one of these lounges the eye is impressed with the beautiful effect obtained from lovely pictures and other ceiling enrichments, and this artistic crown is felt to give a touch of completion to the majesty of the room. Dancing, of course, forms the main attraction during the season, and due attention is given to securing a most efficient orchestra to supply the music for the recreative pastime, which is made all the more enjoyable by occasional vocal, instrumental, and other selections. Doors at the top of the Ballroom staircase give access to the Roof Promenades, from which beautiful marine views are obtained. On the upper promenades smaller shows are arranged to suit the fancy of the hour—the contiguity of the Promenades to the Ballroom also rendering these a delightful resort of the dancing and other visitors. The grand selection and harmonious blending of colours in the marbles of the " Marble Halls," is a distinct feature of the Alhambra. In connection with this work it may be mentioned that the marbles have been supplied by Messrs. Whitehead and Sons, of London. The principal entrance steps are of Ravaccione marble, and the walls of the Grotto Vestibule of warm-tinted Alabastrino, with mouldings and architraves of Rouge Royal and Vert Antique. In the main entrance hall the walls are of coloured marbles—the moulded plinth course being of Grand Antique, the dado of Sarrancolin Red, with Vert Alpes mould at rail and architraves, and the upper portion of Napoleon Grey and Alabaster. The Grand Staircase is of Ravaccione, with carved drapery in Yellow Onyx, Cippolino Rosso, and Pavanazza. In the Inner Hall, Malvern Brocatelle, Genoa Green, Rouge Antique, Alabastrino, and Blue Beige, are introduced. In the Restaurant the main plinth course is of St. Anne's, the dado Vert Alpes and Red Fluri, with Rouge Griotte capping, and the architraves :and pilasters and panelling of Camblanchiere. The marbles used in the Theatre Vestibule are Malvern Brocatelle, Griotte, Blue Beige, and Napoleon and Vert Alpes ; and in the Circus Vestibule, Sarrancolin, Hautville, Malplaquet, and St. Anne's. The managing director of the Alhambra is Mr. Harry Brooks, and the general manager, Mr. William Parker.